It was a peaceful day in the woods. Now and then, a gentle wind blew through the fresh, green leaves of the majestic trees as if, playing merrily with them. Cuckoo birds chirped cheerfully on the branches of the huge peepal trees. Butterflies chased each other merrily and little crickets were jumping here and there. Mother Nature seemed to be laughing and enjoying the frolics of her children. "Sssssss...." here we come!!!" suddenly hissed an evil voice, destroying the mirth and merriment all around. Many-hooded Kalia and his brood slowly emerged from their hiding place. They were venomous beings who poisoned the very ground they slithered on. As they moved now, the grass under them turned black and the trees they passed lost their colour. Kalia surveyed the landscape before him. "What better place to stay with my family?" he thought and grinned. "Halt!" he ordered his family. "This is our new home!" "No!" cried the wind, "Don't do this". "I can't breathe!" lamented a shocked peepal tree. Even the cuckoo birds on the tree branches just reeled over and died, as the air around the area turned toxic. And so the eastern part of the Yamuna River, next to the village of Brindavan, began to slowly die. The morning sun shone over Brindavan. It was like any other day. Everyone went about their usual business. The village primarily consisted of the cow-herd tribes. They were going out to graze their cows in the nearby fields and vales. Suddenly somebody screamed in village chief Nanda's home. Everyone present nearby rushed to the place. But no one could enter inside. There were anxious whispering among the crowd that gathered outside Nanda's home. Who was it? It was Yashoda, Nanda's wife. She sat on the bed, her body shaking in fear. "What happened, Yashoda?" Nanda asked in worry. "Oh dear, I had an awful dream, “shuddered Yashoda at the thought of it. "A giant snake had coiled his enormous body around our little Krishna....and...oh my God!" "It's just a dream, Yashoda". Nanda tried to calm his wife. But Yashoda was not pacified. "I need to see if my son is all right... Krishna! My son...where are you?" she called out. Soon, she heard the pitter-patter of a child's footsteps outside her room. Little Krishna peeked inside. "What is it, mother?" he asked. "Krishna, you should not go out anywhere today, do you understand?" Yashoda said gently, without wishing to alarm her son. Krishna lingered there for sometime. Then he smiled mysteriously. It seemed to Yashoda as if he had some designs in his mind that is beyond any mortal understanding. Then, ignoring his mother's words, he ran out of his home. "Krishna! Kishan... my son! Come back...please." Krishna ran fast in the streets of Brindavan and arrived at the lakeside hideout where his friends welcomed him. Then they started playing with a ball. After some time, they became tired and climbed on a tree to rest. There was a tree house on the top of it. Krishna and his friends had specially made it for their adventures. But the tiny tree was not strong enough to support so many children and it groaned under their weight. Krishna felt bad. "I wish we had a bigger tree to build a tree house. We seem to be crushing this one!" " I know where the biggest tree in Brindavan is," said Kusela, one of his closest friends. " I would have built a tree-house on top of it. But my father said we should never go there." "We must!" said Krishna merrily and ran towards the eastern direction. "I want to build a better treetop hideout. And I need your help. Will you please come with me?" Krishna was loved by all his friends, so what choice did they have than to follow him? Soon Krishna and his friends arrived at the eastern part of the Brindavan forests. But they were shocked at what they saw there. The place looked... ghostly! On the exterior, the place looked bright enough. The lake had plenty of water and there was even a waterfall nearby. But only when the children went near they saw the changes. The water had a bluish colour. But the grass around the lake was not green anymore. It had turned black. There was a huge tree overlooking the lake, but it was on the verge of dying. It had no leaves and its branches were all blackened. It seemed as if the whole place was damned; cursed by some monstrous evil.There was an eerie silence all about the place. "I do not like this place," whined one of his friends." I do not like the place" he repeated, "we should not be here at all! My father will be angry if he comes to know about it." Krishna looked thoughtfully at the lake for some moments. Then he turned to his friends. "Well then, now that we're here, let's at least play ball!" he said and grabbed the ball. He threw it at Kusela, who was unable to catch it properly and let it slip into the lake. The ball disappeared into the waters with a soft plop. "Let me get it," said Krishna and before his friends could stop him he jumped inside the strange waters! "Don't worry, I'll soon be back with the ball!" The water felt too cold and Krishna's skin tingled uncomfortably. But he ignored the feeling. Krishna swam lower and found the plants all burnt and bent as if they were drenched in acid. It saddened him to see the underwater plants dead and black. He looked around to find out the one responsible for it. As his feet touched the bottom, he could see skeletons of small sea animals and fishes lying on the riverbed. An uncanny silence reigned over the whole place. It seemed to be the kingdom of Death. Suddenly a strange sound caught Krishna's ears.It seemed like a hissing sound. "Whoever did this is still here," thought Krishna. As if agreeing with him, a huge snake sliding out of his sea hole. It was Kalia. It was truly terrible to see his large body slithering in the water. Baring his many hoods, he hissed again and faced the little boy. The snake-King was surprised but also pleased to see Krishna. "Hmmm, what do we have here?" he asked mockingly. "Food!" shouted his family in chorus, who were standing behind him. "Yessssss..." Kalia hissed in wicked tones. "We do not get to taste humans often! And you look like a pretty morsel..."
Without finishing his words, Kalia lunged at Krishna. The boy, who had been expecting such a move, deftly jumped back and hid behind a rock. But Kalia moved at a lightning speed and caught him. He coiled round Krishna and started to crush his body. Krishna, who was rather enjoying the fight, twisted his body and slipped out. Kalia was stunned. It was impossible. How could this mere boy slip out of his grasp so easily?. Nobody, no matter how big or small, had ever escaped from his deadly hold. For the first time in his life did Kalia ever experience such a phenomenon. Krishna, meanwhile, jumped over the rock and crouched low. He was in a playful mood and he decided to tease the evil snake. Had he known who his opponent is, Kalia would never have dared to try to devour Krishna. Krishna was, in reality, a divine child. He was an incarnation of the Absolute, the almighty God. He had come to the earth to reward the good and punish the wicked. But Kalia did not know this and he was hell- bent on having Krishna as his lunch. As the snake came around the rock to catch him, Krishna ran over to the other side. The next few minutes were spent in hide and seek until, tired, Kalia lost his patience. "You boy! Why don't you face me like a man instead of dancing like a girl?" he snarled at Krishna. "Oh, I haven't even started dancing yet!" laughed Krishna. "But since you are asking, let me show you how I really dance..."
Saying so, Krishna quickly climbed over the rock and jumped on the snake's enormous hood. He firmly placed his foot on the snake's sensitive head and started to dance. And what a dance it was! The whole lake started to tremble as Krishna danced. The lake anemones and the burnt sea plants started to shake. It seemed as if they nodded their. heads together in ecstasy over Kalia's plight. Even the fishes left alive stood still and watched him dancing over Kalia's head. "Hey you! Stop dancing on my head, will you?" Kalia screamed out in pain. Krishna stopped dancing and slid lower near Kalia's face. He rained blows on his head and climbed on his head to dance again. Kalia grew truly afraid. Now he felt surely that the little boy was no ordinary child. The thud of Krishna's feet felt like the bong! Bong! Of a great hammer on his head. As Krishna danced with more and more vigour, the snake felt his life slowly being pushed out of his body. Kalia's wives were quick to predict Kalia's fate. "Oh, divine child, please don't kill our husband!" they begged him. "I will let him live if all of you promise to leave this place forever," answered Krishna. "But we are so safe in here!" wailed Kalia. "If we go out now, Garuda the giant eagle would surely have us as his breakfast!" "Go to Ramnaka, the snake-kingdom," promised Krishna. "You and your family will not be attacked by any bird or beast till you reach there. That's my promise to you.. Now off you go!!" 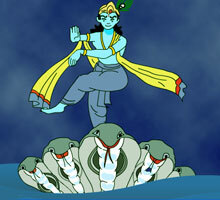 Meanwhille, Krishna's friends ran back to Nanda's home and informed him about Krishna's underwater search for the ball. "He has gone under water for nearly an hour..." cried Kusela, "... and hasn't returned since." Yashoda broke into tears." I had told him..." cried he," I had warned him not to go anywhere... why didn't he listen? Oh my Krishna, my Kanhaiya... what will I do you?" Nanda too was very much scared. He called aloud for the other Gopalas. All the village-folk rushed and followed their chief. Soon Nanda, Yasodha and everybody from the village found themselves on the blackened woods of Yamuna. There was no sign of the little boy, anywhere. Only a deathly silence prevailed everywhere. "Krishna... my son. Where are you?" cried Nanda, "come out! Please!" Suddenly the waters of the lake bubbled and rose above the tallest tree in the woods. The Gopalas moved back and all of them looked in awe and fear as Krishna came out, dancing on top of a huge snake! The snake bent his head in respect as Krishna landed on the shore. Yasodha and Nanda rushed to embrace him. Content with Krishna's promise, Kalia gathered his brood and left Yamuna that very day. True to what Krishna said, neither birds nor beasts attacked the snake family on their way to Ramnaka. Their journey was safe and sound. than ever in the eyes of all his friends. All the boys understood that Krishna was no ordinary child. Tale of his antics spread far and wide. But none of them seemed to have any effect on the little god, who seemed content at stealing butter from his mother's kitchen and enjoying it. His eyes twinkled mischievously and his thoughts dwelled on things beyond the realms of human understanding.